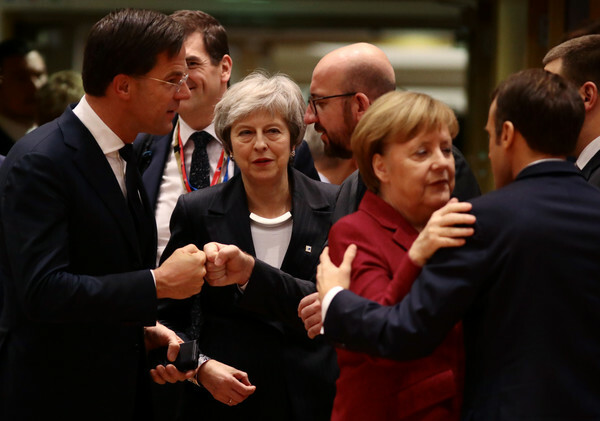 Britain's Prime Minister Theresa May (C) looks on as (L-R) Netherlands' Prime Minister Mark Rutte, Belgian Prime Minister Charles Michel, German Chancellor Angela Merkel and France's President Emmanuel Macron greet each other at the European Council during the start of the two day EU summit on December 13, 2018 in Brussels, Belgium. Mrs May yesterday won a vote of confidence in her leadership among her own MPs 200 to 117. Attending the summit she will attempt to secure greater assurances on the temporary nature of the Irish Backstop, in turn hoping to persuade MPs to vote her Brexit Deal through Parliament in the coming weeks.